JetPro recognizes the connection between strong communities and good business practice by respecting the dedication of local organizations in improving the quality of life in our community. Our tradition of supporting these local organizations by offering flights in our aircraft. The following links offer you some unique chances for a flight in an L39 Albatros jetfighter. Take a one hour thrill ride over the Edmonton River Valley with veteran pilot and owner Ed McDonald. Flight plan includes acrobatics, inverted flight and low level flying. Experience up to 4 G's as you twist and turn through the air as you follow the course of the North Saskatchewan River and enjoy a four-point barrel roll at 800 mph. 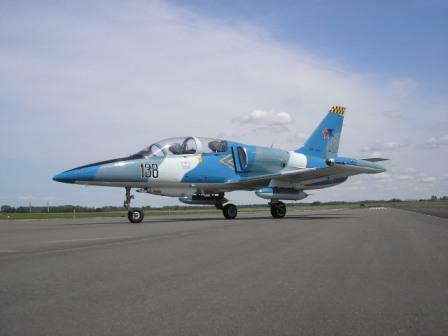 The Friends of 533 Squadron, St. Albert AB is conducting a raffle for the L39 jet flight. The Minerva Foundation of Alberta will be auctioning off a flight at their Charity Gala on April 13, 2010. The Brady Scoggins Make a Wish Golf Tournament will auction off a flight on June 28, 2010. If you are in Banff, the Banff Mineral Springs Hospital Foundation Gala will auction off a flight on March 13, 2010. If you are in Calgary, the Foundation Fighting Blindness Gala will auction off a flight on May 5, 2010. So attend any one of these functions and bid on this exciting THRILL OF A LIFETIME!